Gov. 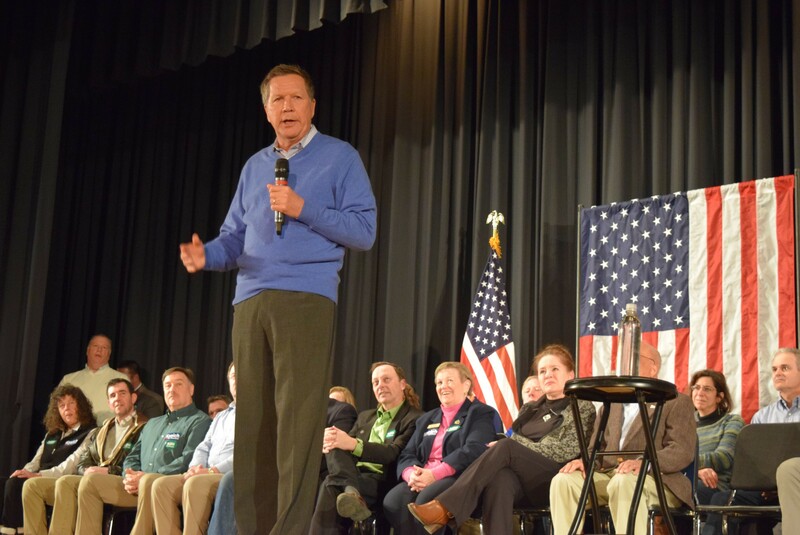 John Kasich speaks in Colchester in February. Republican presidential candidate Donald Trump won big Tuesday in his home state of New York, but his rivals are still hoping they can seize their party's nomination in July at the Republican National Convention. To do that, they will have to continue electing favorable delegate slates in every state in the country — including tiny Vermont, which sends just 16 delegates to the Cleveland convention. The Vermont Republican Party has been holding town caucuses in recent weeks and will make its final delegate selections at its state convention May 21 in South Burlington. On Wednesday, Ohio Gov. John Kasich unveiled his Vermont leadership team, which includes most of the state's prominent Republicans — many of whom previously endorsed other candidates. The list is topped by former Republican governor Jim Douglas, who formally endorsed Kasich on Tuesday. "It is imperative that the next president be ready from day one," Douglas said in a written statement. "We are fortunate that Gov. Kasich seeks the presidency for he is clearly the most qualified candidate by both experience and temperament." Five state senators: Sen. Joe Benning (R-Caledonia), Sen. Dustin Degree (R-Franklin), Sen. Peg Flory (R-Rutland), Sen. Kevin Mullin (R-Rutland) and Sen. Rich Westman (R-Lamoille). Neither Trump nor Sen. Ted Cruz (R-Texas) has announced leadership teams in Vermont, but the New York businessman hired Darcie Johnston last week to serve as his state director, Seven Days has learned. A longtime Vermont political operative, Johnston worked for the late senator Jim Jeffords and managed Brock's 2012 gubernatorial campaign. In 2014, she helped run Libertarian gubernatorial candidate Dan Feliciano's campaign. Johnston currently runs the advocacy group Vermonters for Health Care Freedom. Neither Johnston nor the Trump campaign responded to requests for comment. Trump narrowly edged out Kasich in Vermont's March 1 primary, and the two candidates equally split the state's 16 delegates. But that doesn't mean the contest is over. Those chosen to serve as Vermont's eight Trump and eight Kasich delegates are only required to support their assigned candidate on the first ballot at the Cleveland convention. If a candidate fails to win an outright majority, the Vermont delegates are free to support whoever they choose on the second ballot. Both campaigns, therefore, will seek to ensure that the delegates pledged to their respective candidates will stick with that candidate on subsequent ballots. They will also likely seek to fill the opposite candidate's slate with their own supporters. According to Vermont GOP executive director Jeff Bartley, three of the state's 16 delegate positions will go to party leaders: chairman David Sunderland, national committeewoman Susie Hudson and national committeeman Jay Shepard. Unlike the Democratic Party process, those three will serve as pledged delegates and must choose to fill either a Trump or Kasich slot. The remaining 13 national delegates will be elected at the South Burlington convention by several hundred state delegates, according to Bartley. Those hoping to serve as national delegates must submit a petition with 25 signatures to the party by April 29.